Après L'Ondée (Eau de Toilette) is a popular perfume by Guerlain for women and was released in 1906. The scent is floral-powdery. It is being marketed by LVMH. Inspired by "Origan" it is probably one of the earliest uses of p(ara)-anisaldehyde, whose sweet warm smell resembles mimosa and hawthorn blossom. p(ara)-anisaldehyde was first synthesised in 1845 by Auguste Cahours. In 1877, Ferdinand Tiemann and Hermann Herzfeld developed an industrially utilisable synthesis method. Jean Claude Ellena reports, analysis and reconception of "Après L'ondée" had inspired him to compose "L'Eau d'Hiver". Since February 2014, the historic Louis XVI flacon of Après L'ondée is exhibited in the "Hall of Mirrors" of the Guerlain parent house at the Champs Elysées, Paris. On request, it is possible to smell the scent (extrait), which has been reconstructed following the formula of 1906. The last summer in Berlin will be remembered by many as the rainiest since weather records began. The rain followed cloudburst after cloudburst with impressive and uncompromising power, the water pitilessly shot through the streets, flooded cellars, ruined shoes, engines and tourist dreams and provided plenty of fuel for the climate change debate. Primarily heated the tempers, secondarily served to cool imaginary solar glow. So I spent my time either with mop and tub in the wet cellar or with the Buddenbrooks in my reading corner in the bay window, from where one could admire lilac bushes in their metamorphosis from lush fragrance to wistfully winded rain of flowers. After days of moaning, I was suddenly happy. Blessed. Swarmed with Thomas Mann's wonderful sentences and this world that was now mine. Persecuted spellbound and enchanted the fates and tragically intricate or straight paths of Tony, Thomas, Gerda, Hanno and all the others. Feel with them, smile with them, mourn with them. Celebrated Christmas with them. Commenting on the Germanized tropical climate, he said, "It's just a Kreiz." Après L'Ondée reminds me of these hours, in which a very special tenderness and peace lay. Opened with hawthorn, aniseed, soft lavender and fine spice, fresh and tangy, luminous and powerful like a shower that carries intense fragrances of spring flowers and herbs over the treetops. Softly weaves drops of thread, blurs in clouds, and softly and loosely foggy like a watercolour glaze, cool irises and violets, spread a melancholic antiquated sweetness, which - just like Buddenbrook's life and suffering - might seem unpleasantly old-fashioned and dusty to some. But there's nothing dry or musty about this powdery, pale blue melange, but exactly the same cotton-soft grace and dreaminess that inspired me so much about Chant d'Arômes. After the rain - and this was always a special moment - sometimes a pale sun shone through the leaves of the oak trees, the world was immersed in magical silence and the bay window in lilac-warm light. is just as bright violet, light, pure and beautiful A fragrance for comforting solitude under a pale sky. For compassion, quiet thinking and intensive remembering. For the time after the rain. Espectacular eau de toilette, extremely romantic and evocative. I had read so many reviews and commentaries over this classic before I tried it that I expected a humid violet very powdery and aniseed aroma. But to my surprise far to find a blue and gloomy cologne, the outstanding on me carnation note, makes this purple composition become warmer and more optimistic than I expected and somehow out of the blue connected to some of my most loved classics as Vol de Nuit and En Avion. A delightful beauty. Top Notes: Cassia, Neroli, Anise, Bergamot, Lemon. Heart Notes: Mimosa, Carnation, Sandalwood, Violet, Orris Root, Jasmine, Vetiver, Ylang-Ylang, Rose. Base Notes: Iris, Amber, Musk, Benzoin, Vanilla, Heliotrope, Styrax. After reading about Apres L'Ondee a few years ago, I was eager to try it because I am familiar with other Guerlain parfums, and I felt certain I would love it. 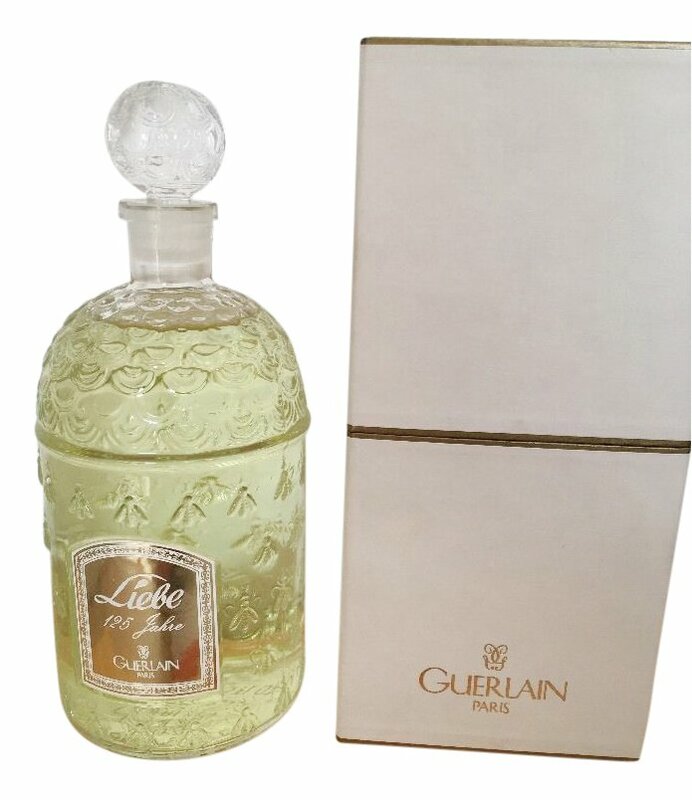 There is a rumour circulating that it will soon no longer be available in the U.S., and there is another rumour that Guerlain intends to stop making it altogether, so before either one of these possible eventualities became realities, I ordered the eau de toilette on-line from an Amazon seller. This review primarily concerns the current EDT, but I do discuss the vintage extrait at the end to some extent. The Apres L'Ondee EDT indeed smells very fresh and bright. I found it to be almost loud upon first application of it to my skin, but it quickly dried down to a softer scent. I would describe it as a quite green scent, but it is not green in the way that Diorissimo is green, for example. It smells of soft, vaguely sweet grasses and cut flower stems, not the blossoms so much but the green stems. I do smell flowers, but they seem more distant than the grasses and green stems. I do indeed pick up on a wetness to it as well. After it was on my skin for a couple of hours, I could definitely detect a very light, sweet, vanilla or honey note to it. It is quite charming in the dry down. I do not particularly like the top notes, but I have only worn it a few times, and my opinion may change later. I like the dry down which is soft, vaguely sweet but not sugary sweet at all, grassy, and slightly wet. Apres is a very demure scent, and as other reviewers have noted, it it not very long lasting. I had perhaps two to three hours of it before it was completely gone. I intend to apply some scent-free lotion before I apply the Apres next time to see if the lotion will help it to linger longer on my skin. The EDT has moderate to strong projection upon first application, but it quietens down pretty quickly. Sillage is also moderate upon first application, but it, too, quietens down quickly. My biggest criticism is the current EDT's lack of longevity, but this is a criticism I have of virtually all eau de toilettes, and it is the reason why I buy eau de parfum if it is available. Unfortunately, Apres L'Ondee in either eau de parfum or in extrait formulation is no longer made, so if you want to try it, you will either have to purchase the current EDT or find a vintage bottle or decanted sample. I have been able to sample a vintage Apres L'Ondee in pure parfum formulation, and it is MUCH different from the current EDT. As expected, the vintage parfum has a deeper, creamier smell to it. It is also a bit sweeter but still not candy sweet. It has that wet, grassy sweetness about it. It wears very, very close to the skin, even closer than the EDT and its presence, too, was quite fleeting on my skin. I feel privileged to have been able to sample the long since discontinued extrait, though. My overall impression of Apres L'Ondee is favourable. After trying it, I do not think anyone exaggerated in describing Apres L'Ondee as an utterly beautiful, iconic fragrance, a classic creation. It is unlike any other scent I have ever tried. Do I recommend you buy a bottle of the current EDT? Yes, it is worth sampling and keeping in your collection as a reference point as well as an historical artefact should Guerlain stop making it. Do I recommend you buy a vintage EDT, EDP, or extrait? Yes, a vintage is very worthy of the cost, and I think if you like this type of scent, then you will really like the vintage Apres L'Ondee. For me, this perfume is about Iris (Orris Root) and powdery violets... along with a selection of delicately balanced florals. Like a bouquet of flowers that only stays fresh for a few days, before wilting and shrinking out of existence. I also get the heliotrope and anise, which were hallmarks of his later masterpiece L'Heure Bleue. I think, many of these older perfumes by Guerlain provoke an emotional response. It's not just something nice to put on and go about your day. This one, along with stuff like Jicky, L'Heure Bleue, Mitsouko and the legendary Shalimar all create different emotions in the wearer. In short, they are all perfumes that make you think. That is why they are around long after the people who created them have died. Like paintings hanging in galleries. Except these are things you can smell and touch. It's fascinating... and Après L'Ondée is no exception. Sometimes, the most beautiful things in life are often fleeting and temporary. Après L'Ondée is one of those experiences. It's one perfume which everyone should experience at least once. You may be surprised by how simple and delicately beautiful this one is. Even if it's not for you, I don't think you'll have smelled anything like this being made today. It is a lovely one though. Do try it. As a child, with my parents, I went in glades around Tople? village to enjoy the fresh air and the beauty of nature. I remember a special moment when we reached a glade with grass woven with threads of violets. Life simply flowed through that lawn, I could feel it. We lay there, on the meadow, all three of us and looked up to the sky, enjoying the sweet scent floating around us. The smell of the moist ground, because there, in my village the soil is never completely dry, as if it will always hold hands with the rain, never letting her go. This smell merged with the feeble flowers. The piece of blue sky that we saw there was the canvas on which we painted our happiness. This is how Apres L'Ondee smells to me: delicate violets mixed with joy, untainted by the surrounding world. Apres L'Ondee is the fragrance that will make you love the rain, even if you do it just to enjoy the wonders that arise after its passing. The rain has darkened the skies; the thick taint of burning tallow is wafting down the panelled corridor. The boudoir tapestries feature a pastoral scene and I try to identify the significance, but I am not Catholic and the allegory escapes me. Jacques has gone to Mass and has ordered me to sleep. "You are enceinte, they will understand"
I doze fitfully until fully awakened in a churning fit of nausea; the kitchen odours of roasting lamb mixing violently with the church candles are the culprit. Jacques will return soon. The child flutters butterfly wings in my belly. I tell Jacques that since I am with child my nose is more sensitive than his. He laughs and says that misery loves company. Jacques has offered to create a perfume after my name, a Regal lily, to rival the fields that Ernest Wilson found in China just three years ago. "But it wouldn't be French, it wouldn't represent my life..and it would make me ill, my darling"
"Then I will create the fragrance of your world, for you, my beautiful Lily of the field"
It is this he works on, a present for a woman who cannot abide strong parfum, and much to his chagrin, is frequently indisposed by the very nature of his business. How can he tolerate such a pale, fair skinned weakling? I have apologised to the point where he will not hear another word. "Trust me, I can bring you the sun, the rain, the soil and the simple flowers of the hedgerows distilled into a parfum that will not make you sick. And then I will fuse it with a meteorite that none may replicate it. It will be our secret, for the child we conceived after the rain shower"
He is hopelessly romantic and I hope to always be his muse. I summon my maid to help me wash and find fresh clothes. The laundered Broderie Anglaise undergarments have been perfumed with lavender sachets and lie folded, five high, in a huge Armoire in my dressing room. They polish the walnut armoire with beeswax and sprig it with herbs to keep moths away until these, too, permeate the clothes. I love the fresh scent of herbs, they do not sicken. My maid, Mathilde, has taken a scoop necked chemise for me to wear and tied the satin ribbon in a small bow behind a tweedy waistcoat. I will walk with my husband in the woods behind the chateau and pick violets for tussie mussies. Cleaver weed will attach to the velvet of my walking skirt, Jacques will laugh at my disarray. The soft silty soil will adhere to the petticoats; the maids will not laugh. Soon we will be Maman and Papa but there is yet time to walk after the rain shower. The Parfum (extrait) is no longer in production. The aldehyde C.14 had not yet been invented in 1906 (it came 2 years later), but in 1877 the German chemists Tiemann and Herzfeld had managed the syntheseis of the "aldéhyde anisique" using a substance called anethol - and this is what was used to give "Apres l'Ondée" its muted charme. I can't tell how much the formula has changed from the original to my bottle (2005), but the fine balance of the notes, the magic of this composition always makes my heart sing! I am no chemist - let alone a perfumer - and I always feel that unless you don't know 100% what's in a perfume (and would they ever tell us??? ), there's always much speculation going on about the actual components which I am in no position to take apart. What I can say is that "Apres l'Ondée" is well rounded - it does not fall into pieces, top-notes are not much different from the scent's heart - it is all a lovely, consistent cloud of sheer beauty. "Apres l'Ondée" is a quiet scent, I feel comfortable wearing it, no fabulous sillage, no monster-longevity, I can reapply the EdT during the day without disturbing others and enjoy the fragrance again. "Apres l'Ondée" speaks of tranquility, of quiet landscapes, of tenderness, too. It has a meditative touch, it's the epitomy of a finely balanced perfume. Every note is 100% necessary, nothing is superflous, nothing should be added or taken away. Harmony in a bottle. An absolute masterpiece. Après L'Ondeé is an astonishing fragrance to me. I experience neroli and anise at first, but only briefly. Then violets and woods, with hints of jasmine and rose. It is powdery, soft, dreamy, melancholic. Après L'Ondeé ends with iris. A gorgeous iris is mixed with the amber and musk of the base notes in a delightfully unexpected and yet familiar way. If L'Heure Bleue is the queen of the house of Guerlain, the stately monarch presiding over special occasions, Après L'Ondeé is the princess. Dewy-fresh, and in youthful reverie. Fresh, clean, flowery and powdery. As ingenuous and natural as can be, APRES L'ONDEE has no hidden, inner, subterranean depths to penetrate, and thus differs rather radically from my concept of classic Guerlain—especially from compositions such as MITSOUKO and L'HEURE BLEUE. Yet this perfume is beautiful, too, in its own way. My distinct impression is that Prada was trying to capture something like this aesthetic in its Infusion series, especially INFUSION D'IRIS edt, the most recent launch, to which violet has been added. The INFUSION trio is also very clean, but it is far more woody and, in the case of INFUSION D'HOMME, soapy as well. There is no soap in APRES L'ONDEE at all. The cleanness of this scent is that of fresh rainwater-washed purple flowers, no more and no less. Although APRES L'ONDEE features key notes—violet, iris, heliotrope and anise—in common with a number of other more recent perfumes, here they are presented in an unsweetened state and without other components which tend to muddy the waters somewhat. There is not a single speck of dirt anywhere to be sniffed in APRES L'ONDEE. For that reason, some people may find this perfume simply too simple, more like a nineteenth-century violet soliflore than a masterpiece. However, those who seek out high-quality notes such as are featured in the sometimes simple perfumes of niche lines are bound to appreciate APRES L'ONDEE. In my case, the appeal is overdetermined: I love niche-quality notes, in general, and violet, iris, heliotrope and anise, in particular! My understanding is that this perfume has been discontinued, and I'm thinking that maybe that's not such a bad thing, since at least if I manage to acquire a bottle it will not (I presume) have been disastrously reformulated. Write the first Review for Après L'Ondée (Eau de Toilette)!